Currently at Rose Gallery is Graciela Iturbide: Hay Tiempo, an exhibition of beautiful photographs by the Mexican photographer. Graciela Iturbide, celebrated as one of Mexico’s most prolific and distinguished photographers, observes with patience and exhibits her world with beauty, serenity and dignity. Born into a conservative family in Mexico City, Iturbide decided to create her own path, leaving a traditional domestic life to pursue the arts. During her studies in cinematography at the Universidad Nacional Autonama de Mexico, she became the achichinle (the assistant) to Manuel Alvarez Bravo, the distinguished Mexican photographer who later became a lifelong mentor to Iturbide. In their time together, Álvarez Bravo constantly reminded Iturbide to pause and observe, asserting Hay Tiempo (There is Time). This patience to allow the moment to unravel and reveal itself echoed the notion of a Mexican poetic tempo, which is present throughout Mexican art, literature and life. Iturbide came to understand and employ her mentor’s slow, observational process as she photographed many cultures and spheres. Although Iturbide has photographed all over the world, she is widely known for the photographs she has taken in her native Mexico. While many twentieth-century photographers had documented Mexico through an outsider’s lens, shining light on poverty and politics in a neocolonial gesture, Iturbide reached beyond the document, photographing the poetic essence embedded in each moment. With Hay Tiempo in mind, she evokes a lyricism in her careful observations. In the late 1970s under an assignment for the INI (Instituto Nacional Indigenista), Iturbide photographed the Seri tribe, focusing her lens on Mexico’s indigenous population which was often overlooked and marginalized. In these portraits, the deep cultural and spiritual history of indigenous peoples exists alongside the influences of colonialism and an encroaching globalism. Then, in 1979, the celebrated Mexican artist Francisco Toledo invited Iturbide to photograph his native city Juchitan in the southern state of Oaxaca, where she encountered the strength and independence of the Zapotec women. In this indigenous, matriarchal community, the women live economically and socially independent lives in a stark contrast to the customs of westernized Mexico that Iturbide grew up within. Iturbide’s photographs, equally grounded and imaginative, portray the power and spirit of each individual. Their direct presence in the image exhibits the persevering dignity of the indigenous people in a post-colonial world. Iturbide’s photographs of Mexico show not only the diverse and rich cultural history of her nation, but also the resonance of Iturbide’s own artistic community, which invited and encouraged the photographer to explore her own nation in its multiplicities of experience. 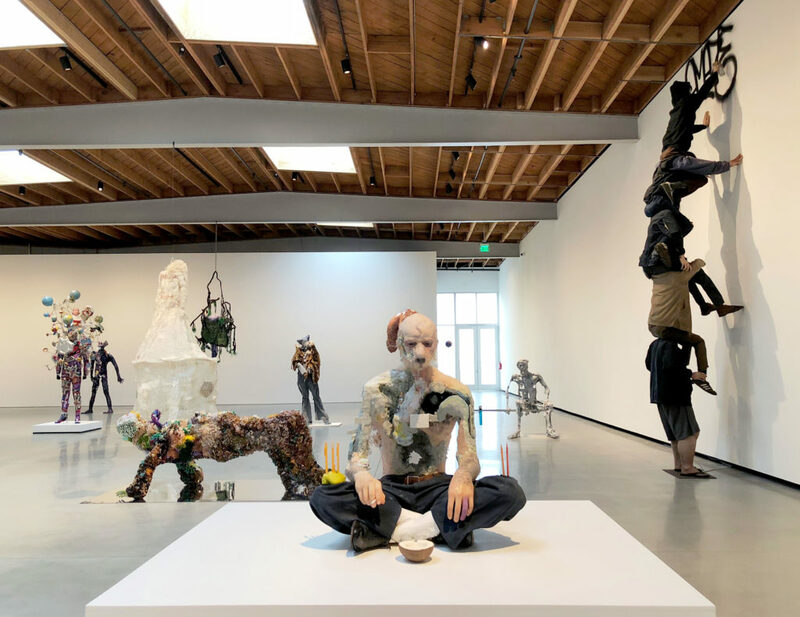 Pasadena currently has a lot of great art shows going on. 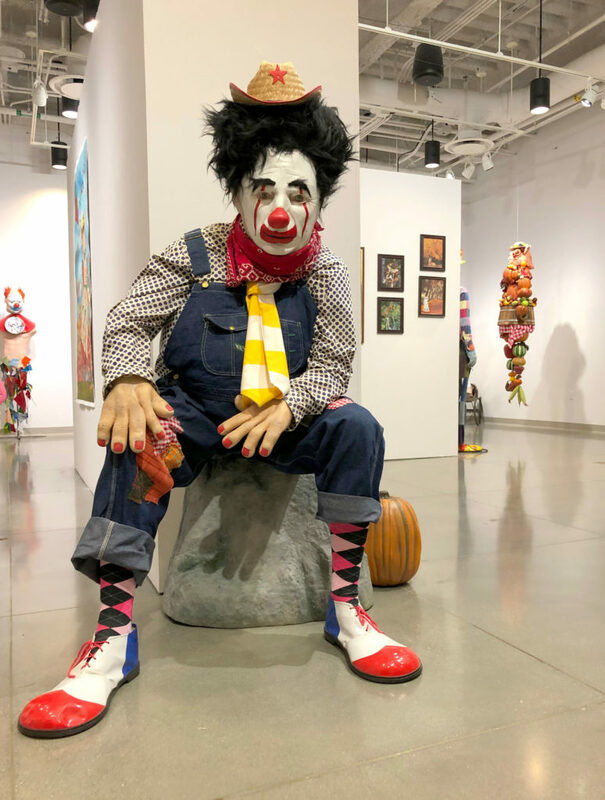 Depending on your susceptibility to coulrophobia, Marnie Weber’s exhibition (pictured above) at Pasadena City College is a fun and slightly unsettling collection of sculptures and images depicting a variety of odd characters. 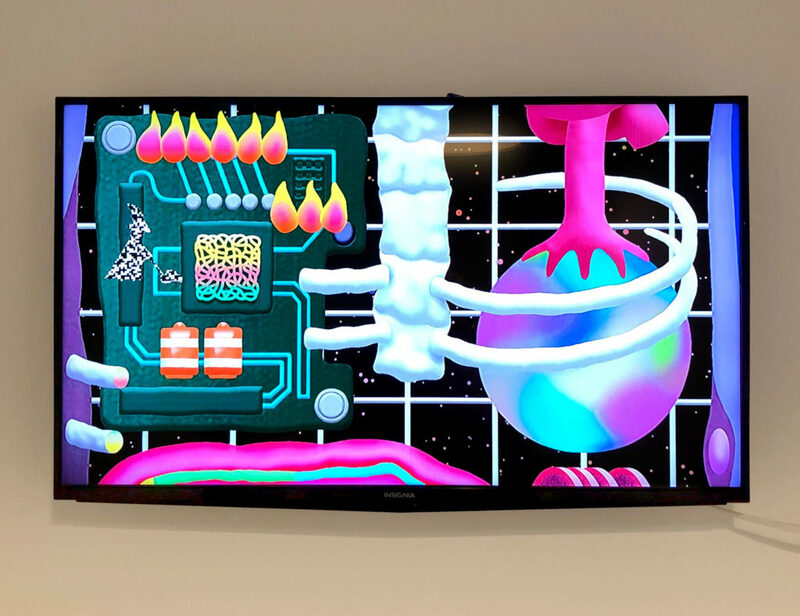 sp[a]ce at Ayzenberg’s exhibition (shown below), The Universe is in Us, curated by Mark Todd, includes a selection of artists working in different media including painting, sculpture, collage and video. 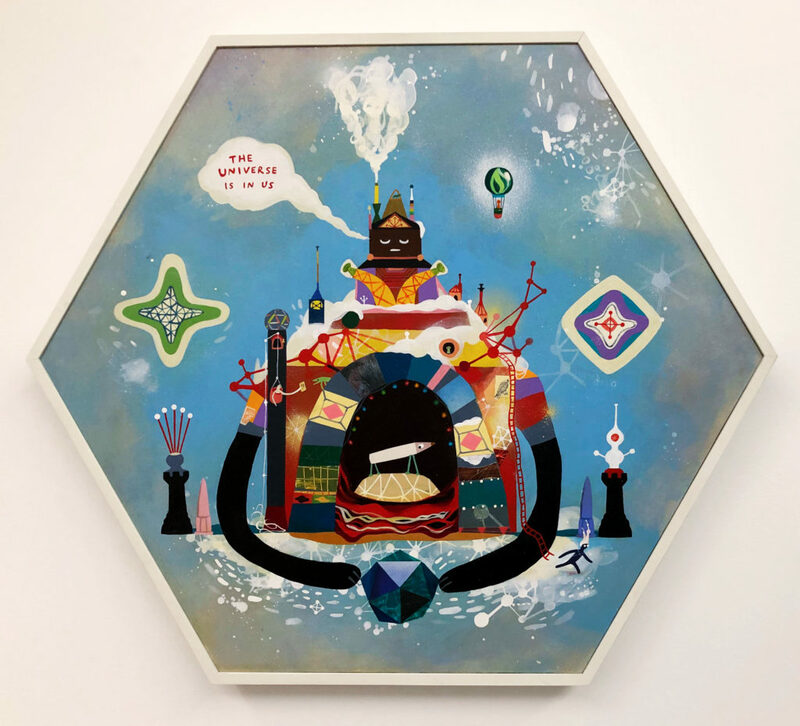 For The Universe is in Us, Todd has assembled a diverse array of artists who honor the vastness of the universe around us through the raw material of our physical biology, our spirit, our emotion, and just everyday life on planet earth in contemporary society. 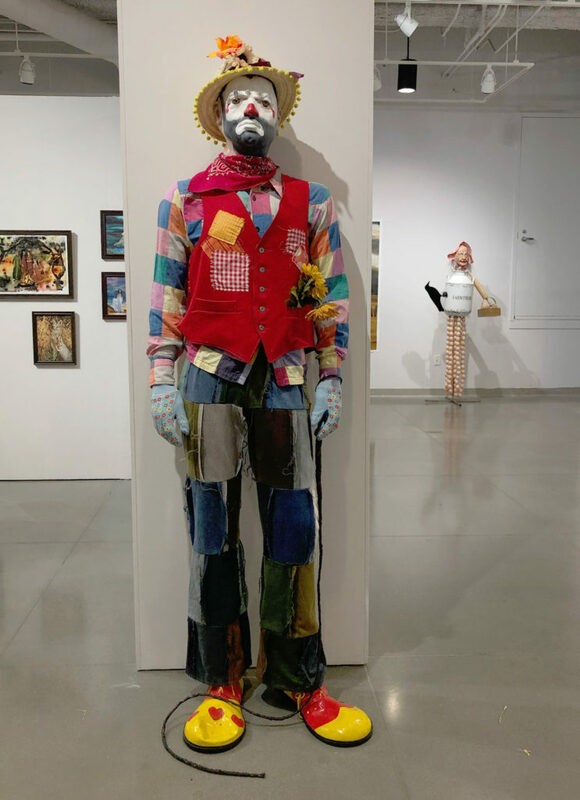 At the Armory Center for the Arts, there are two exhibitions (shown below)- Sara Kathryn Arledge: Serene for the Moment and Sandra de la Loza’s Mi Casa Es Su Casa. In this exhibition, abstraction is an entry point to consider daily encounters marked by abundance, loss, transcendence, and a dream-like passage of time. An under-recognized painter and innovator of mid-20th century experimental cinema, Sara Kathryn Arledge (1911-1998) was a prolific artist who emphasized the eerie in the mundane and the disorienting in the beautiful. Arledge worked at the margins of art history, shaping her practice with idiosyncratic personal myth. She is considered a pioneer of ciné-dance (dance made uniquely by and for the medium of film) and was one of the first to film dance movement to “extend the nature of painting to include time.” The exhibition includes over 60 of Arledge’s vivid works on paper, seven short films, and a selection of hand-painted glass transparencies. The work quietly suggests that subjective, “alternative” normals are equally legitimate. 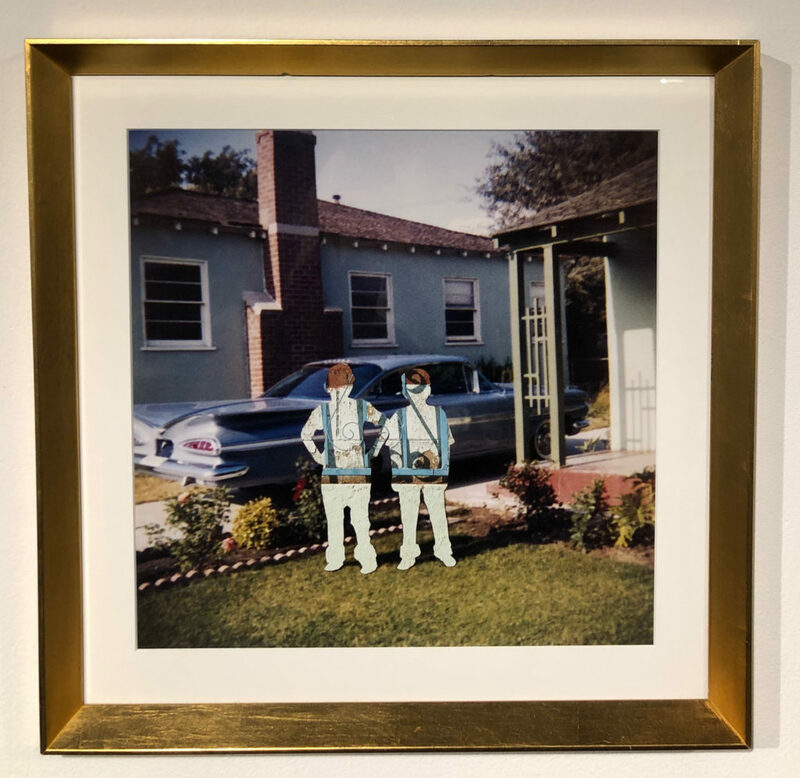 In Mi Casa Es Su Casa, Sandra de la Loza interrogates historic photographs of her own Mexican American family to address issues of power, memory, and history through the concept of home. 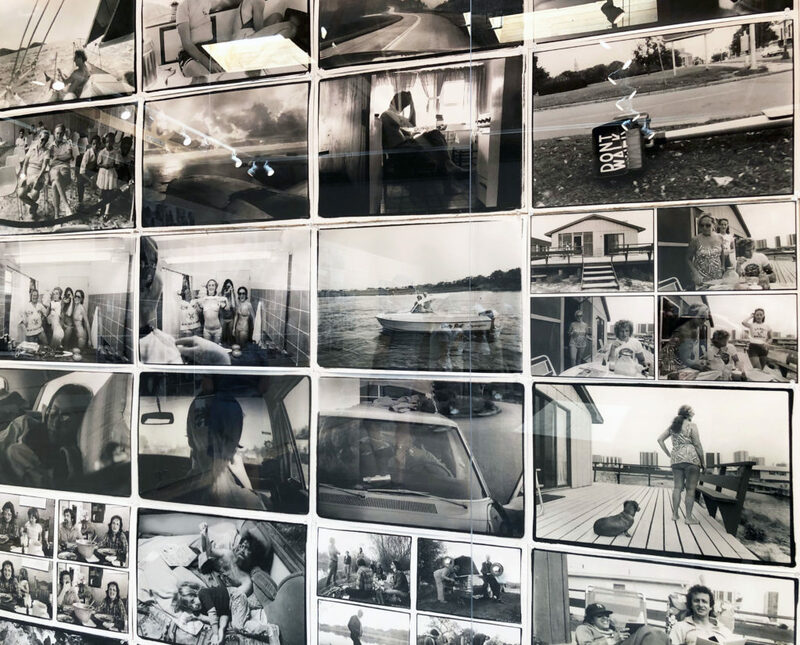 By obscuring, blurring, and replacing the bodies and faces in the photographs, she points to the codes that comprise the family photo—the landscape, architecture, pose, and fashion to investigate the uneasy and slippery terrain of representation itself. With this immersive installation, which simultaneously searches for shifting, non-reductive portrayals as it deconstructs hegemonic myths, de la Loza highlights a central paradox of our contemporary moment, where an increased social desire for fluid notions of identity coincides with a heightened demand to dismantle historic and current economic, political, and cultural violences. 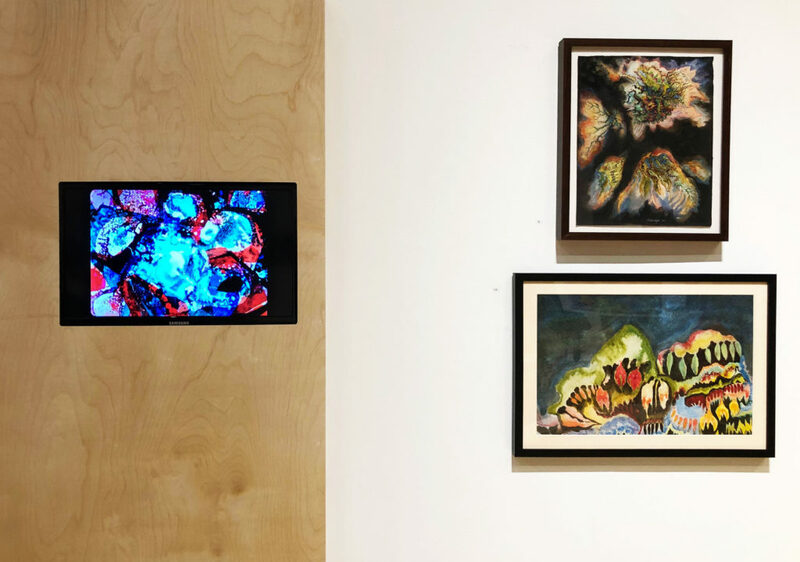 Both of these exhibitions are on view until 5/12/19. 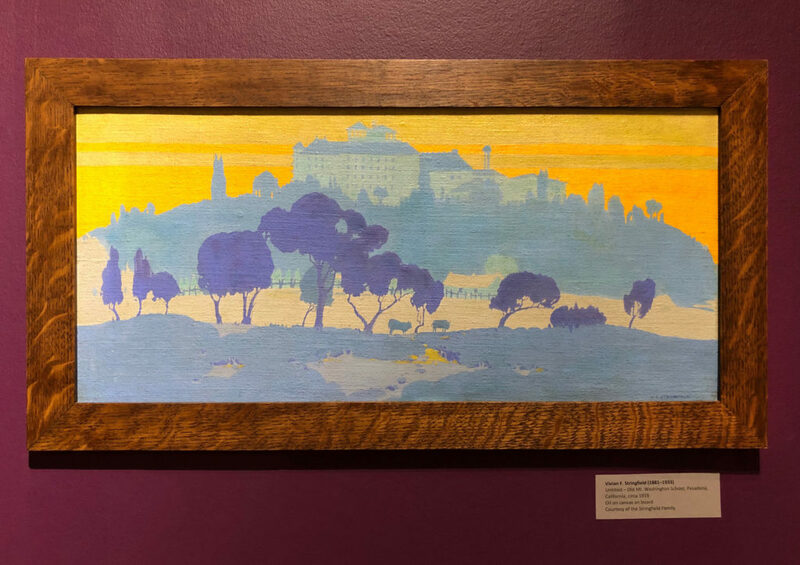 At the Pasadena Museum of History is Something Revealed; California Women Artists Emerge, 1860-1960, which includes over 300 artworks in various media including oil paintings, works on paper, ceramics, metalcraft, textiles and sculpture. It’s a chance to see work from artists who were skilled in their craft but often overlooked because of their gender. One of the standouts from the exhibition is the work of Vivian F. Stringfield (pictured below), whose work was influenced by Japanese woodblock prints which were collected in Europe and the U.S. during the early 20th century. She also partnered with fellow artists Fannie Kerns and Marjorie Hodges to produce greeting cards in the late 1910s, some of which are also on view in the exhibition. This show has been extended through 4/13/19. 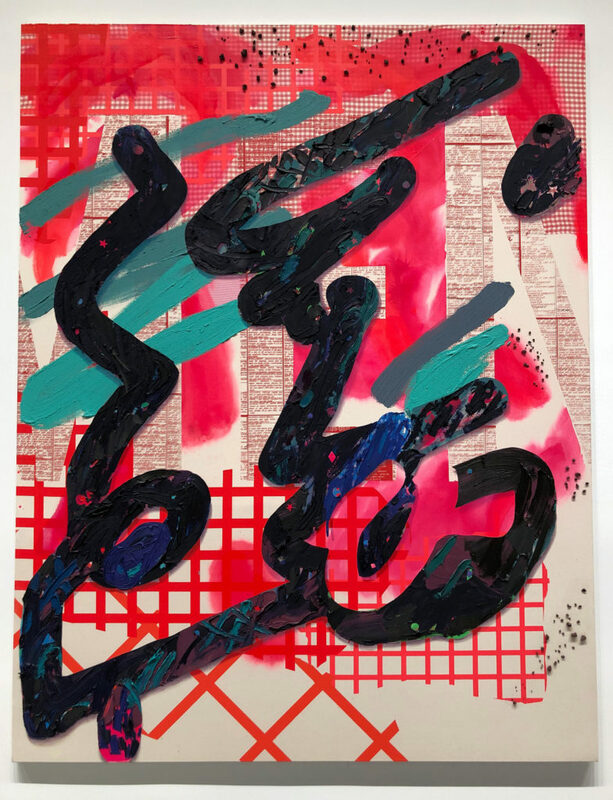 Currently at The Geffen Contemporary at MOCA are Laura Owens mid-career survey and Zoe Leonard: Survey. Two very different exhibitions, each exceptional in their own way. 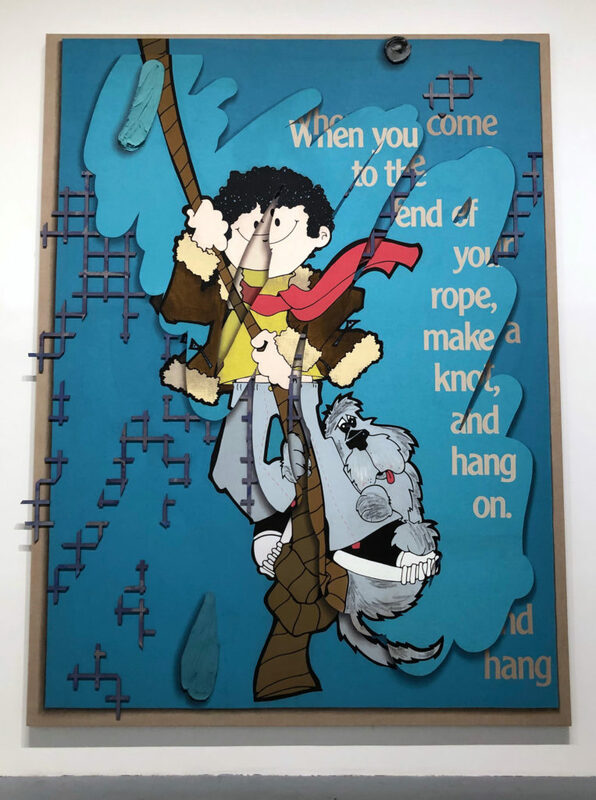 Laura Owens’ exhibition (pictured above), captures the exuberance of her work throughout her career from the mid-1990s until today. Looking at the colorful paintings, it’s the details you don’t notice at first that give them added depth and life. 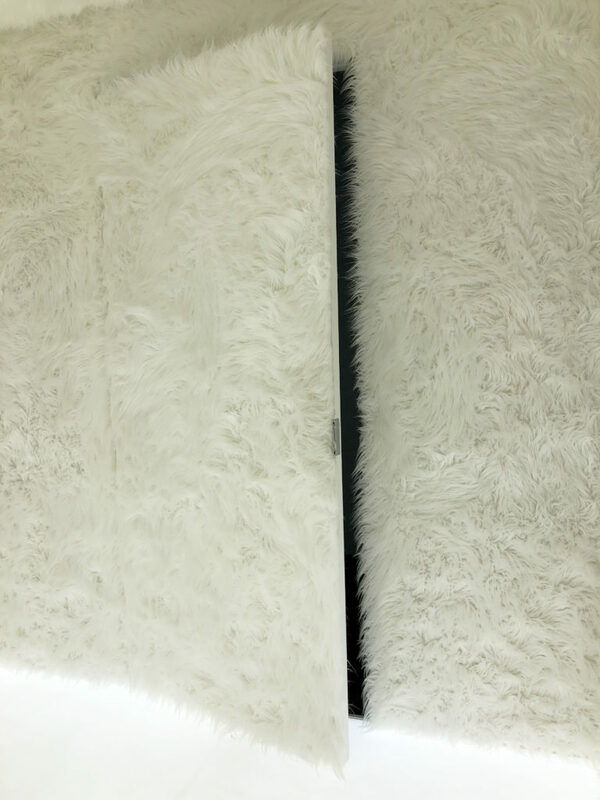 Textured paint seems to float above the canvas and in some of the work sculptural pieces extend beyond the frame. Traveling from room to room you can see her style grow and change while still keeping elements from the previous work. 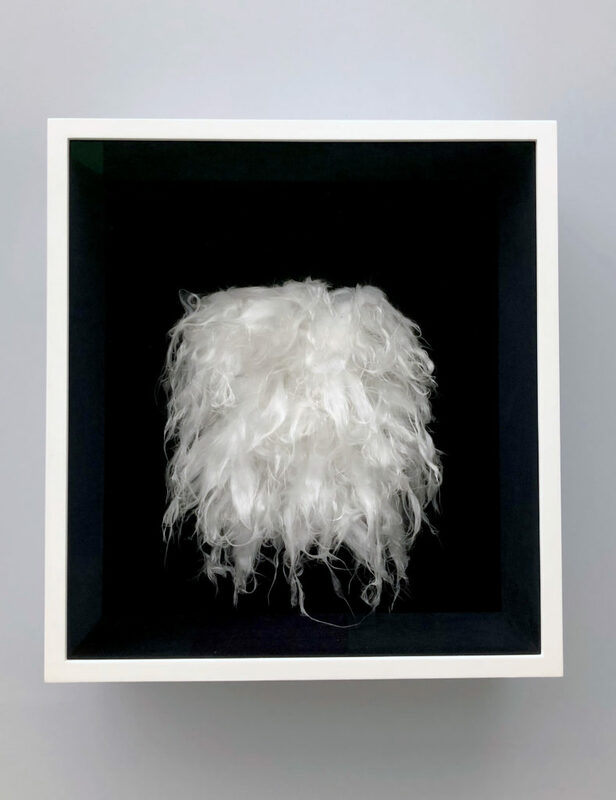 Zoe Leonard’s exhibition (seen below) is a thought provoking collection of the artist’s work that varies between the political and the personal and sometimes a blending of the two. 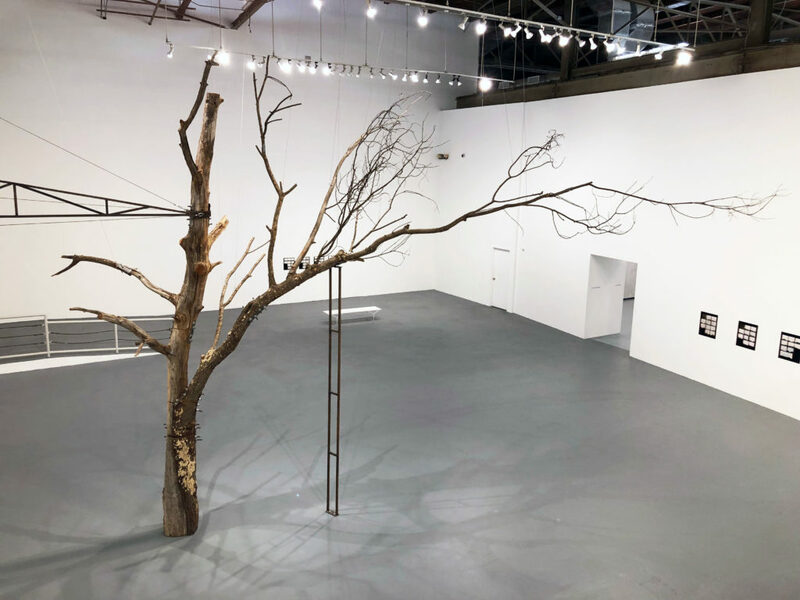 A tree sliced apart and bolted back together is suspended in a room that also contains contact sheets of birds in flight. 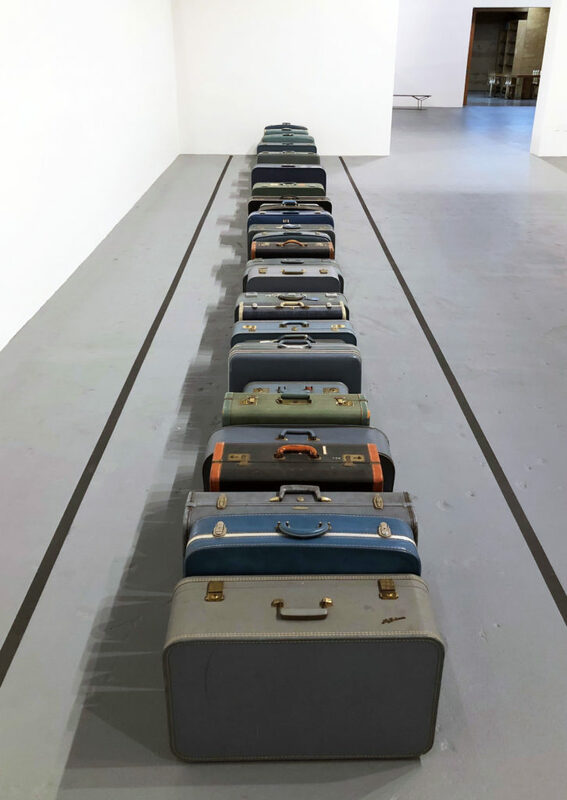 In another, there’s a line of suitcases, one for every year of the artist’s life. There are photos taken of the sun and a table with stacks of postcards of various views of Niagara Falls. 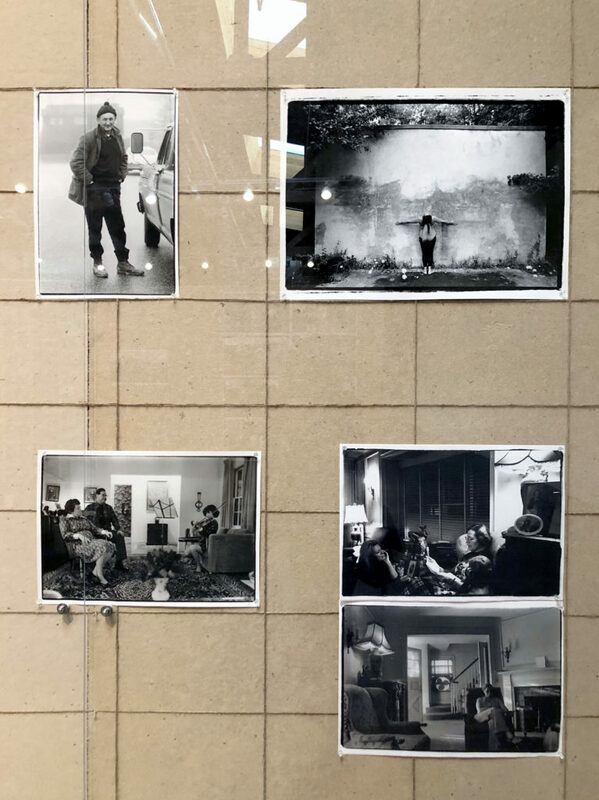 Black and white photos of animals who have been killed and dismembered confront you in another section of the gallery. Nature, death, and the passing of time are common themes present in Leonard’s work and in our own lives. The effect is meditative. 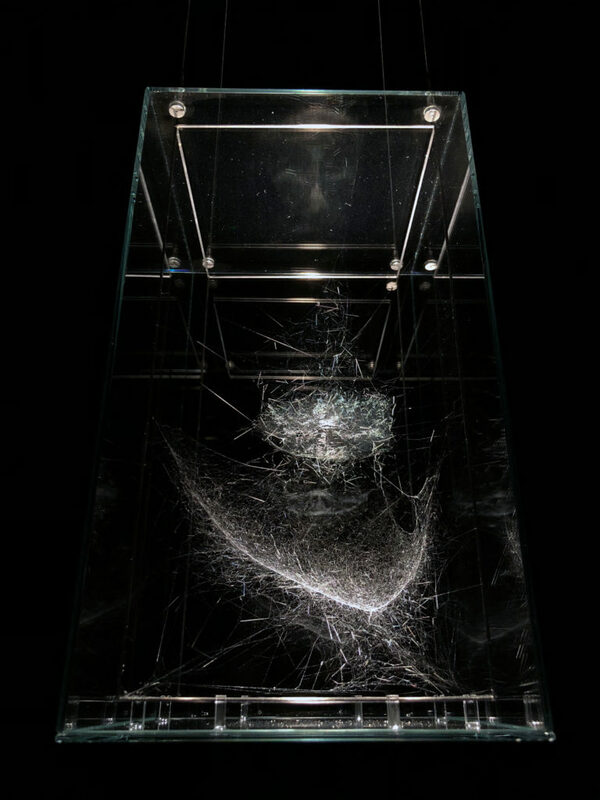 New York–based artist Zoe Leonard (b. 1961) is among the most critically acclaimed artists of her generation. Over the past three decades, she has produced work in photography and sculpture that has been celebrated for its lyrical observations of daily life coupled with a rigorous, questioning attention to the politics and conditions of image making and display. 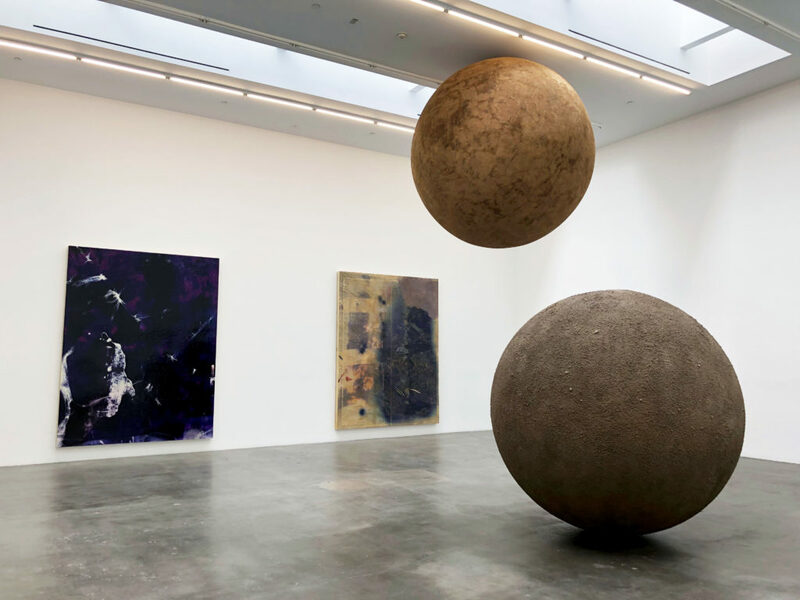 Zoe Leonard: Survey is the first large-scale overview of the artist’s work in an American museum. 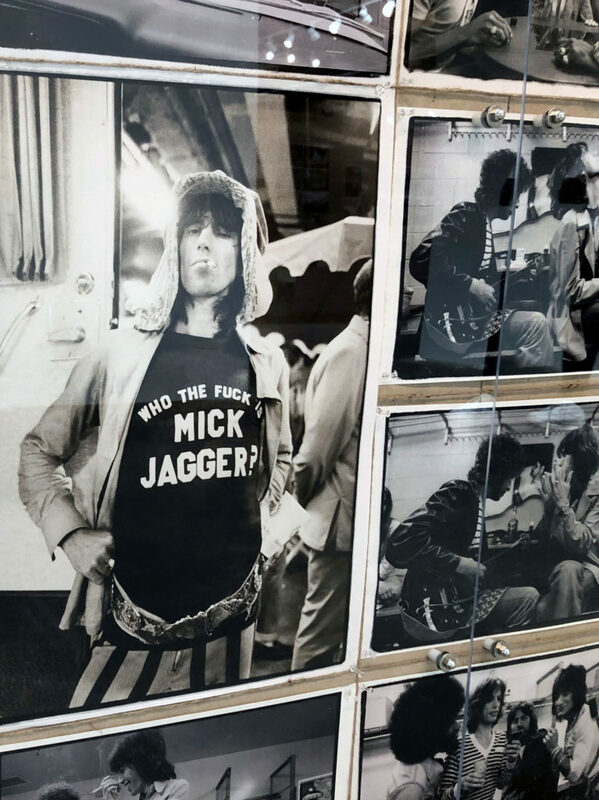 The exhibition looks across Leonard’s career to highlight her engagement with a range of themes, including gender and sexuality, loss and mourning, migration, displacement, and the urban landscape. More than it focuses on any particular subject, however, Leonard’s work slowly and reflectively calibrates vision and form. 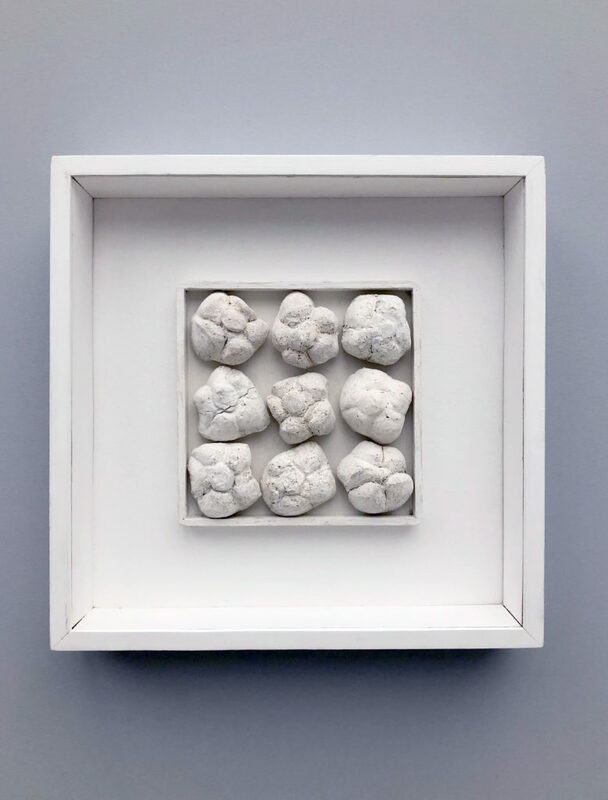 Using repetition, subtle changes of perspective, and shifts of scale, Leonard draws viewers into an awareness of the meanings behind otherwise familiar images or objects. 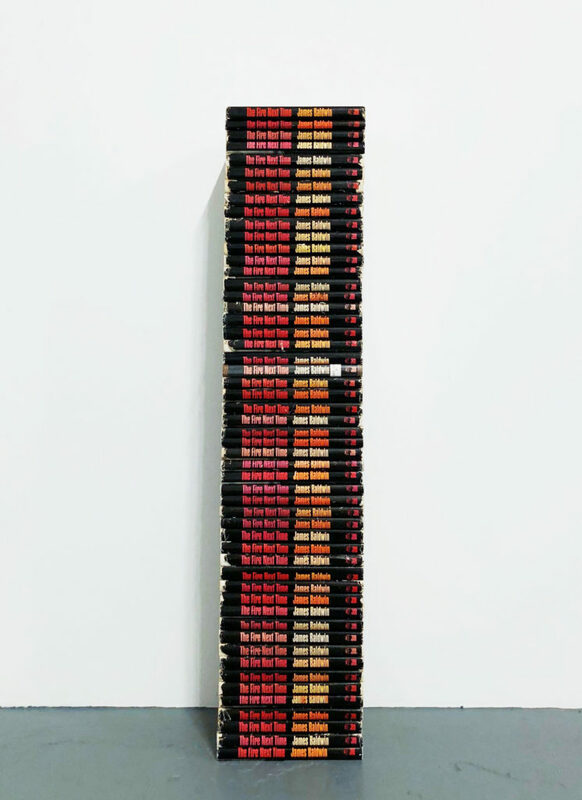 A counter-example to the speed and disposability of image culture today, Leonard’s photographs, sculptures, and installations ask the viewer to reengage with how we see. 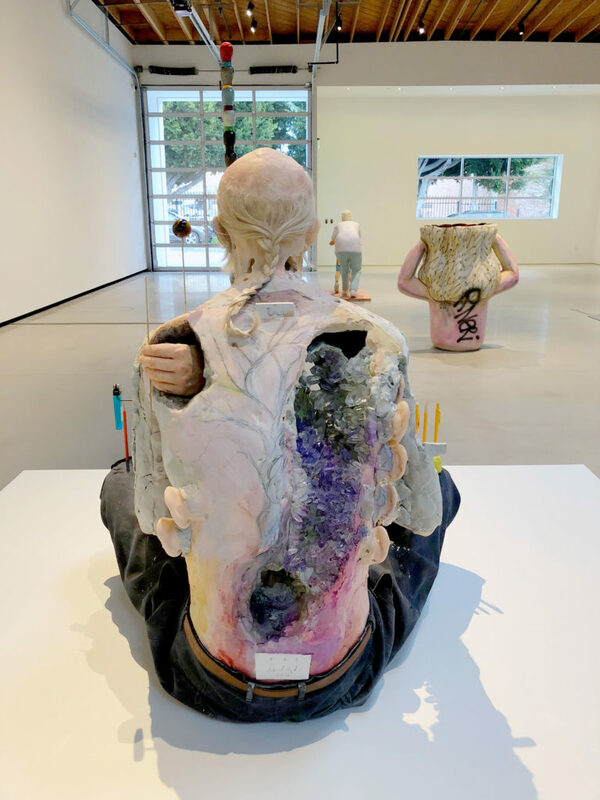 On Sunday, 3/24, MOCA Senior Curator Bennett Simpson will lead a final walkthrough of both of these exhibitions before they close on Monday 3/25/19. Admission is free to the museum and this event this weekend. Taking and viewing photos has increasingly become an important part of people’s lives, especially with the introduction of Instagram and the ability to use your phone as a camera. We are looking at more and more images than ever before. But when you are looking at a photo, how much of what you are seeing is real? 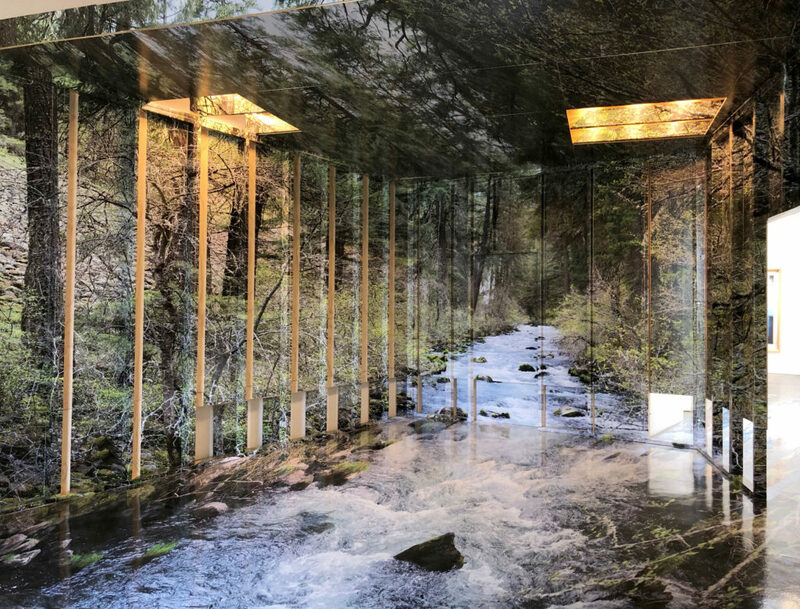 Chris Engman’s show Refraction at Luis de Jesus Gallery challenges these perceptions through his creation of photographic environments. When you enter the gallery you walk into the site-specific work Containment, which took over 300 individual prints to create. It’s an immersive piece that gives the viewer the chance to see how Engman’s final images are created. The second room of the gallery houses several photos of different recreated natural environments, including sand dunes and a cloudy sky. 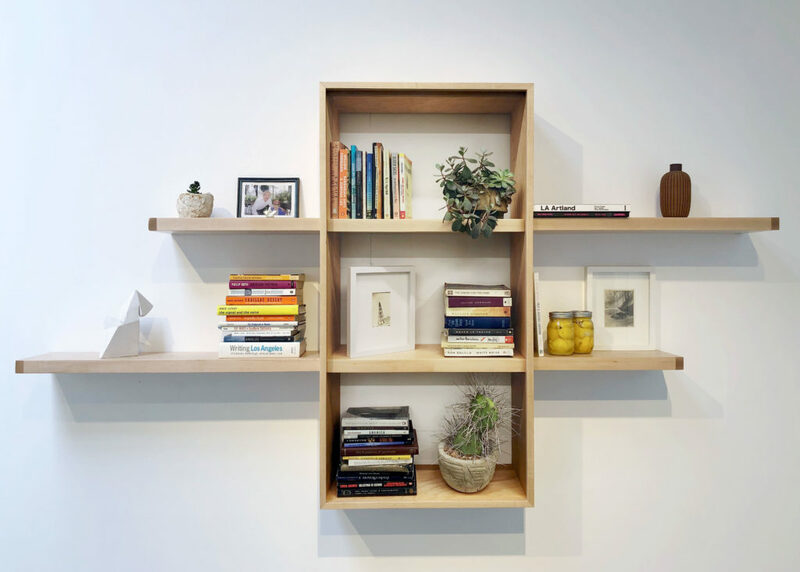 On one wall there is a book shelf (pictured above) where the center is a photograph of a bookshelf and to the left and right are actual objects, furthering the challenge to question everything you are looking at. Looking at a photo of books on a shelf, next to real books on a shelf, what makes more of an impression to your eye? What is the difference between looking at a photo of the sky and a photo of a construction made of photos of the sky? Refraction explores the relationship between illusion and reality by exposing the deceit inherent in photographic image-making while engaging in philosophical and material play around slips in translation. Refraction refers to the change in matter or information as it passes through one medium to another. Refraction occurs when our experience of the world is mediated through photographic images. Engman states: “We see more than we would have, and there is value in that. But the thing, person, or place that is imaged is also irrevocably changed. Photographs resemble and seem somehow in proximity to places and moments we cannot access in ways we wish we could. This produces a continuous and oblique kind of yearning for what we wish could be present or more fully understood,” resulting in a mental projection through which we fill in the gaps, adding detail or meaning. 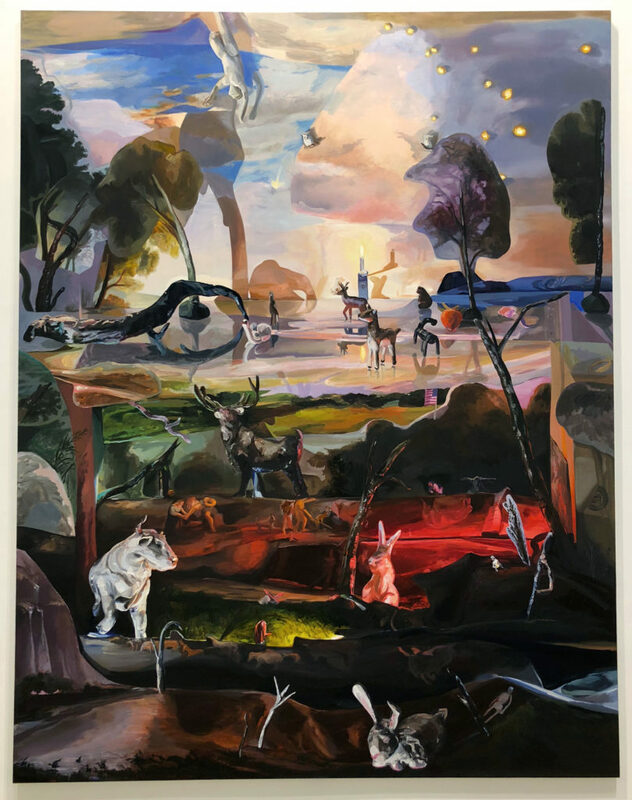 For Emma Webster’s current exhibition Arcadia at Diane Rosenstein, she created dioramas based on historic paintings, lit them in a theatrical manner, and then reproduced them as oil paintings . The results are dramatic worlds where a sense of foreboding weighs on the scenes. This is not the fictional Arcadia of pastoral harmony, which the title of the exhibition references, but something more. 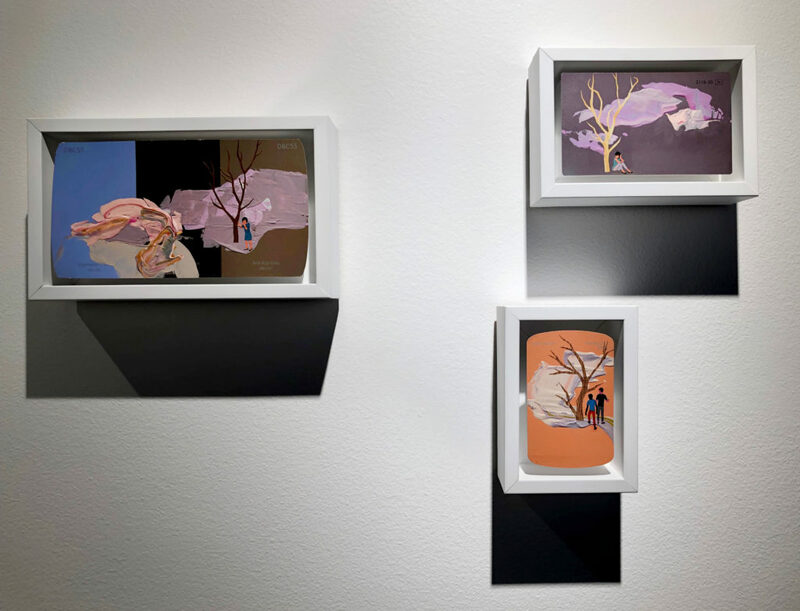 The show’s title Arcadia alludes to recycled and reassembled notions of nature and art passed down from antiquity. These fake bucolics, where each tree is as much a reflection of its maker’s hands as it is a symbol, point to the ways humanity manipulates nature, seeing nature only as it relates to mankind itself. As in garden design, man contrives his own aesthetic of “natural” beauty despite the existence of another untamed and unpredictable reality. Considering climate change and deforestation, Emma Webster’s landscape as still life rings a warning. In the paintings with complex scenes, like Still Life, there is more of a feeling of collage than painting. A figure appears to be falling from the sky at the top of the canvas, day and night blend, and a tiny American flag is seen among the figures of animals and people. There is too much going on for the scene to be peaceful. In Actaeon, the imagery is simpler. 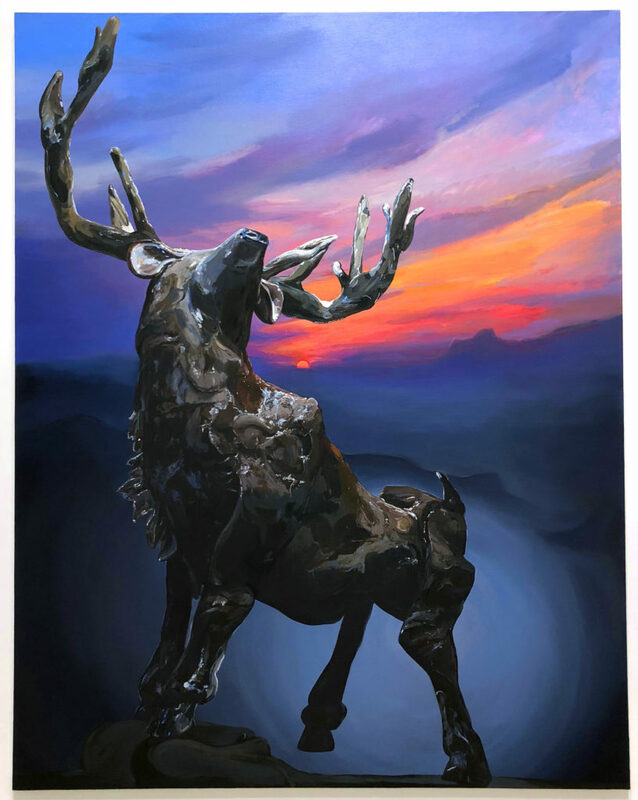 Referencing the myth of the hunter turned to a stag by Artemis and devoured by his own hunting dogs, the painting depicts the stag against the backdrop of a rising or setting sun. The figure is imposing, but at the same time it is also evident that it is a painting of a figure originally made in clay. Webster’s paintings keep the viewer guessing at the layers of meaning behind the worlds she created, both simple and complex. They are also beautiful, skillful works that reveal more the longer you look at them. Blum & Poe’s current exhibition Parergon: Japanese Art of the 1980s and 1990s, is a selected survey exhibition of Japanese art of the 1980s and ‘90s, curated by Mika Yoshitake. 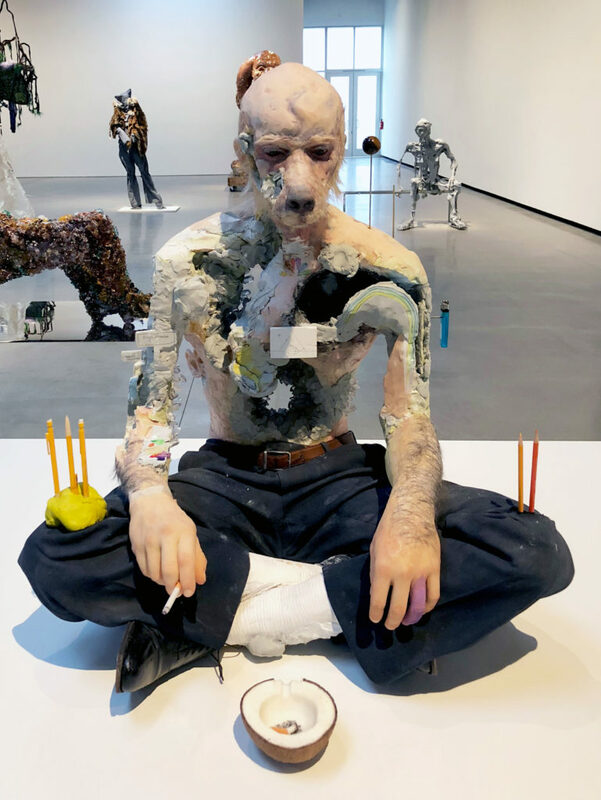 It includes the work of over twenty-five visual artists in a variety of media including painting, sculpture, video, and photography. 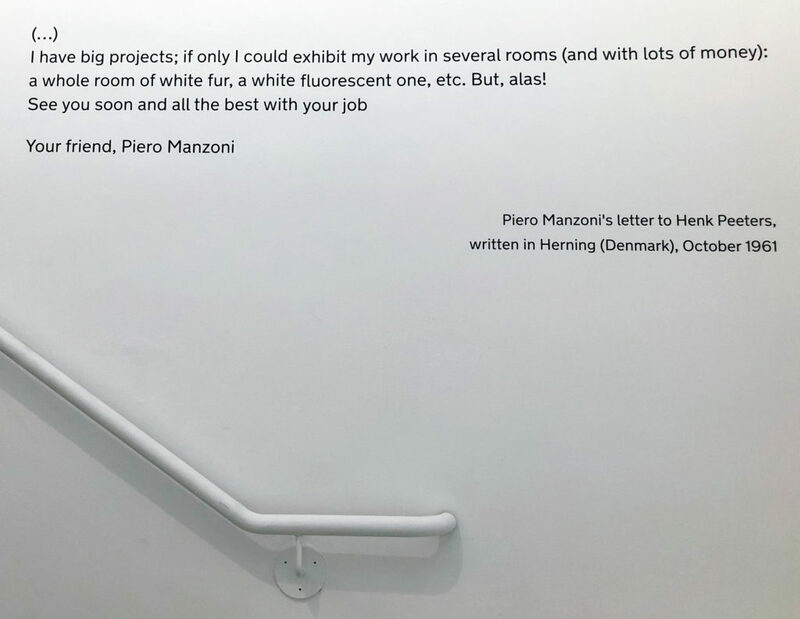 The exhibition title makes reference to the gallery in Tokyo (Gallery Parergon, 1981-1987) that introduced many artists associated with the New Wave phenomenon, its name attributed to Jacques Derrida’s essay from 1978 which questioned the “framework” of art, influential to artists and critics during the period. 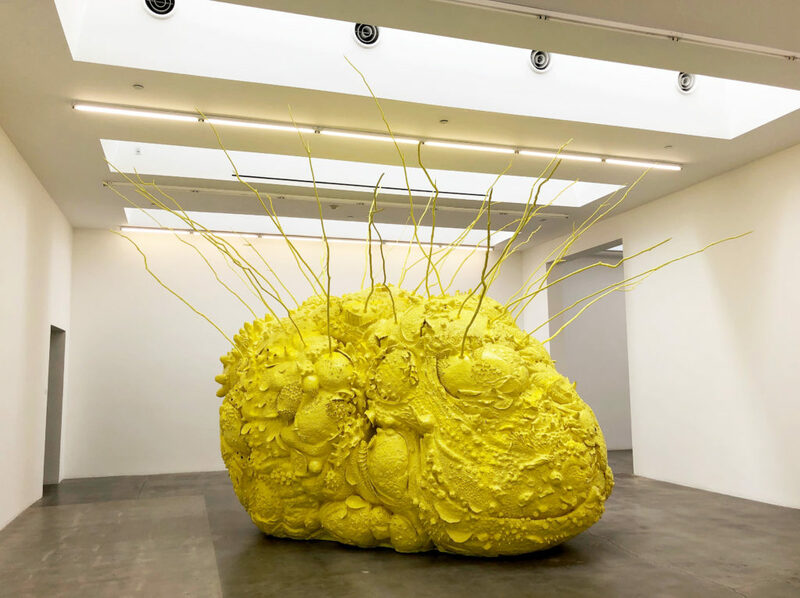 Parergon brings together some of the most enigmatic works that were first generated during a rich two-decade period that are pivotal to the way we perceive and understand contemporary Japanese art today. 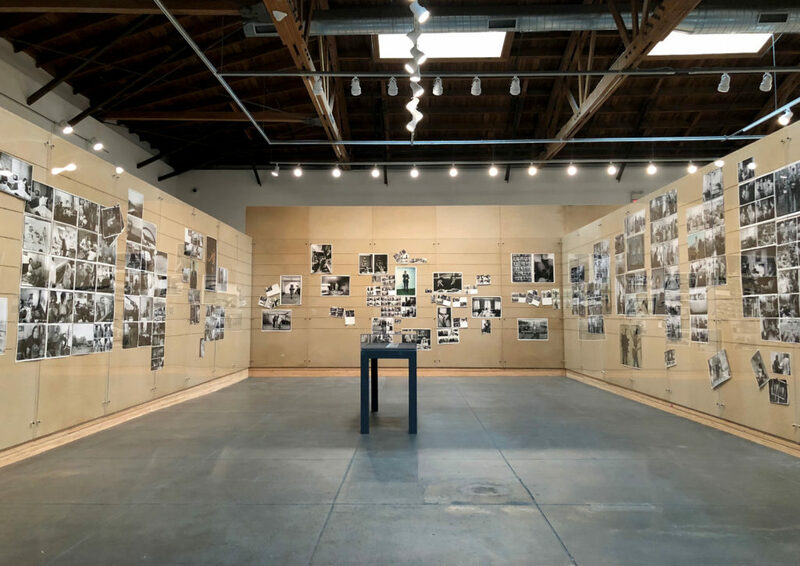 In the aftermath of the conceptual reconsideration of the object and relationality spearheaded by Mono-ha in the 1970s, this era opened up new critical engagements with language and medium where artists explored expansions in installation, performance, and experimental multi-genre practices. When the U.S. and Europe were witnessing a return to Expressionism alongside a postmodern aesthetic of simulacra and deconstruction characterized by the Pictures generation, this zeitgeist of cultural capitalism was instead manifest under Japan’s unique social and geo-political conditions resulting from the rise and burst of the bubble economy. 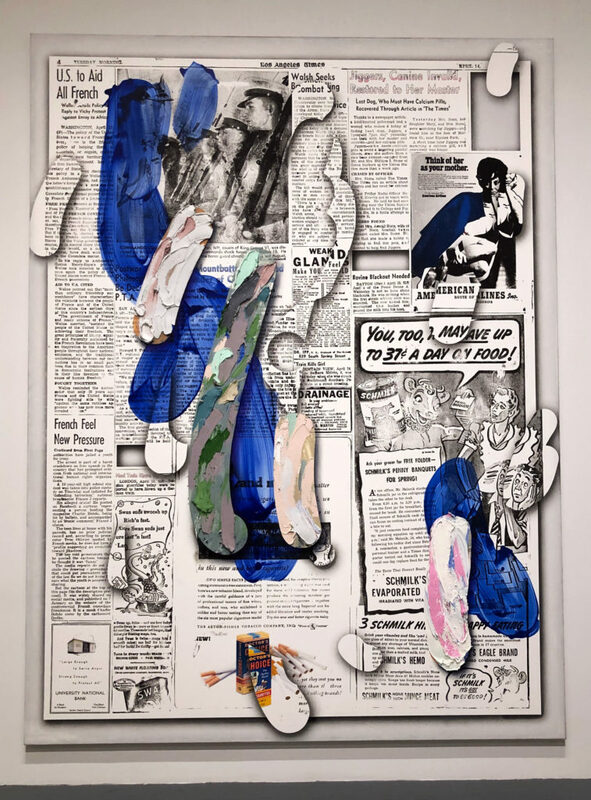 Artists began to explore subversive artistic languages and integrate underground subcultures into their practice using a variety of media, ranging from experimentations in electro-acoustic music, geopolitical and conceptual photography, and appropriations of advertisement culture. Others addressed the internalization of historical avant-garde and modernist aesthetics that were filtered through a new poetics of form, space, and language. In the post-1989 Hirohito era, politics of gender, nuclear crisis, and critique of nationalism are especially poignant among artists from the Kansai region. This period also witnesses the rise of art collectives in the mid-90s and their darkly humorous performances and conceptual practices that reevaluated the history of Japan’s postwar avant-garde. These events reflect on a subculture generated out of a profoundly unique “infantile capitalism,” anticipating the explosive rise of the Neo-Pop generation. 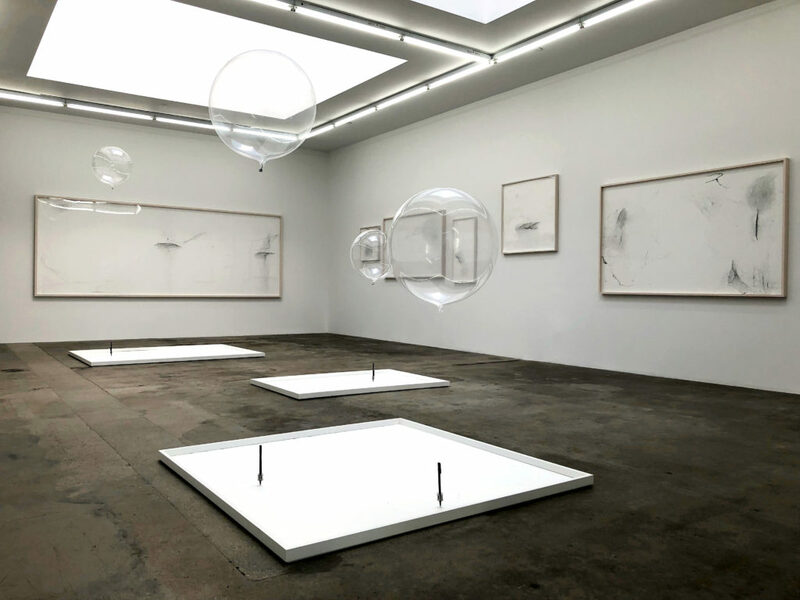 This exhibition is presented on the occasion of Blum & Poe’s 25-year anniversary. 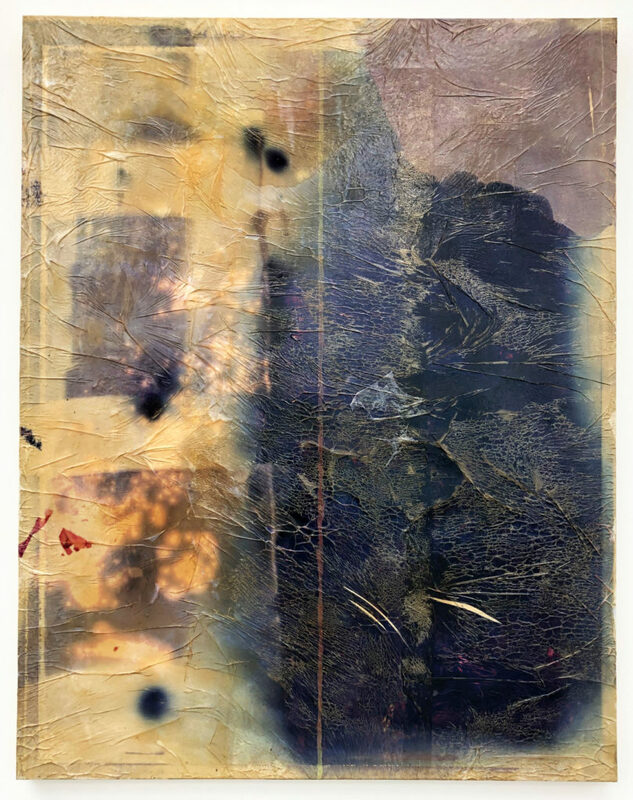 Parergon commemorates a special facet of the gallery’s history rooted in this very timeframe in Japan—with Tim Blum’s early years as an art dealer and curator spent in Tokyo in the early ‘90s—and charts a bridge between the Japanese art historical territories the gallery has long championed. 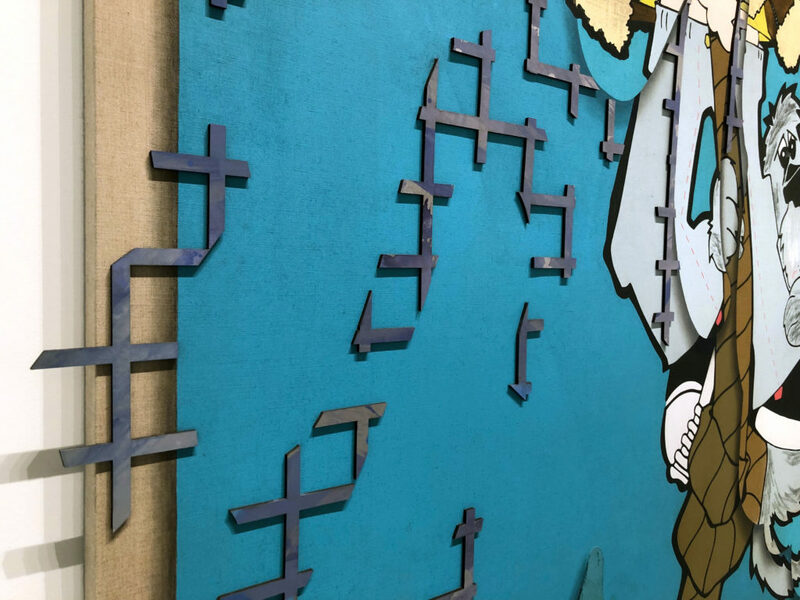 Parergon pursues the creative significance of the years between the milestones of Mono-ha and the Neo-Pop generation now synonymous with Takashi Murakami and Yoshitomo Nara. 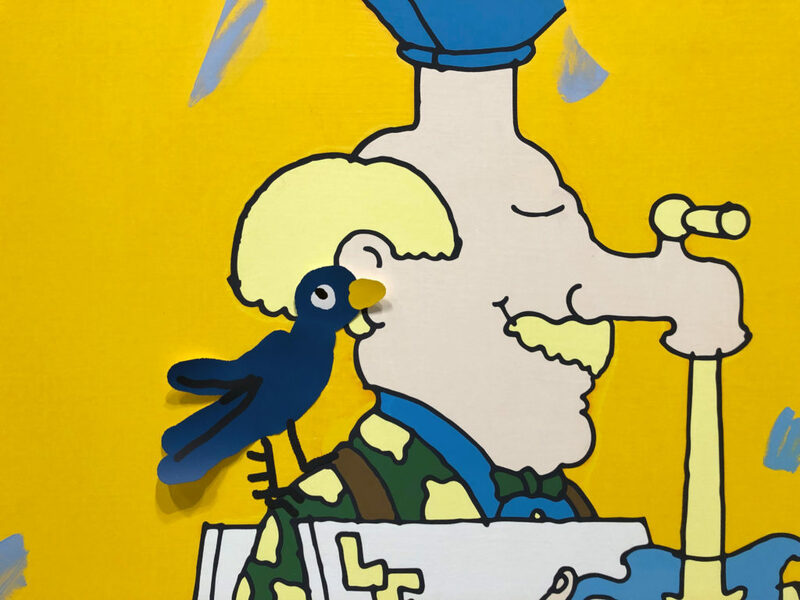 This exhibition closes 3/23/19. Part II will open 4/6/19. 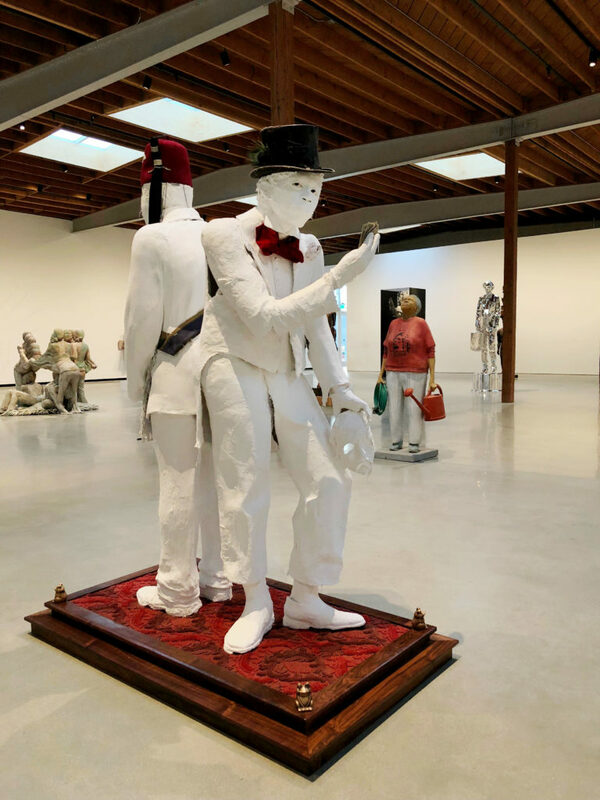 Currently at The Rendon Gallery, at a pop-up space on Palmetto Street, is Los Angeles based South African artist Ralph Ziman’s exhibition, The Casspir Project. The Casspir is a massive military vehicle that was used to terrorize the civilian population in South Africa during the apartheid-era. Sadly, they are still used by police forces in certain parts of the world, including in the United States. 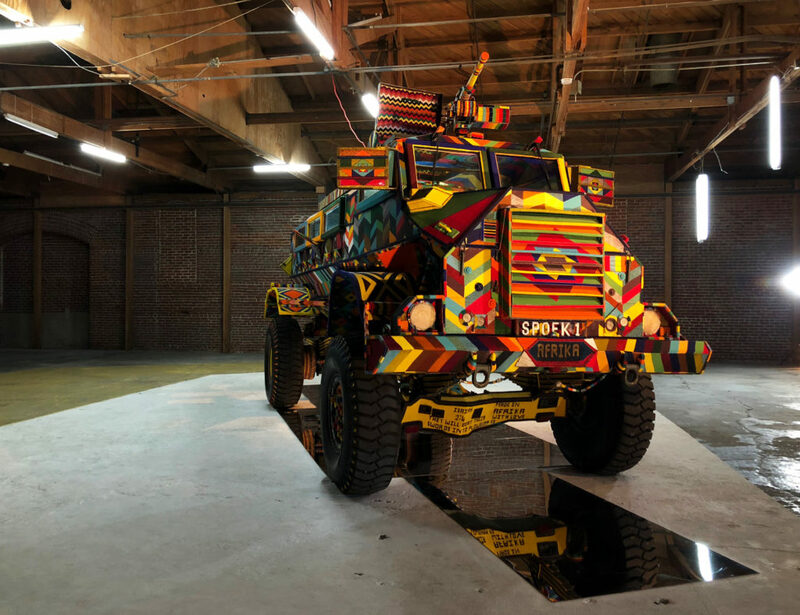 Ziman, with a team of artists from Zimbabwe and the Mpumalanga province of South Africa, have covered the Casspir in brightly colored beads in traditional patterns, making something beautiful out of what was once a symbol of horror. 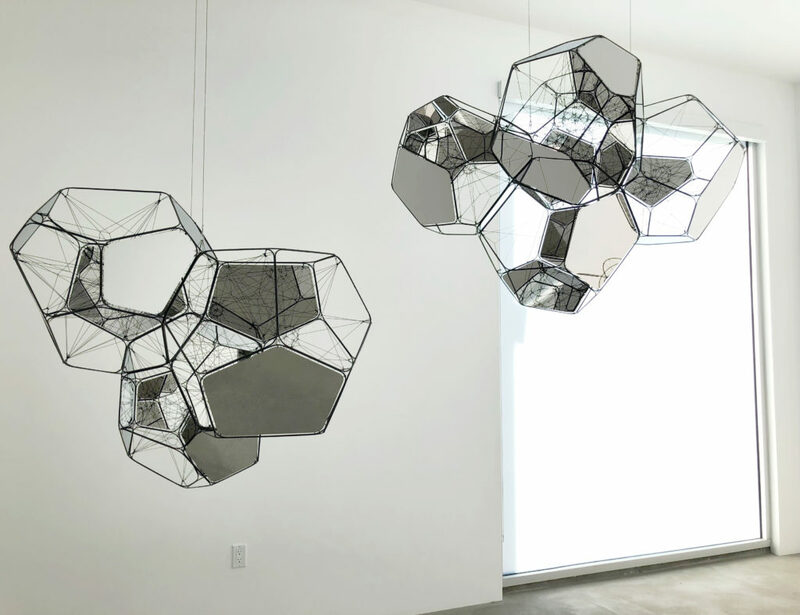 For this iteration of The Casspir Project, Ziman has designed the massive gallery space with a “macro and micro” experience in mind. Each room within the gallery space brings context to the next, informing the project as whole. 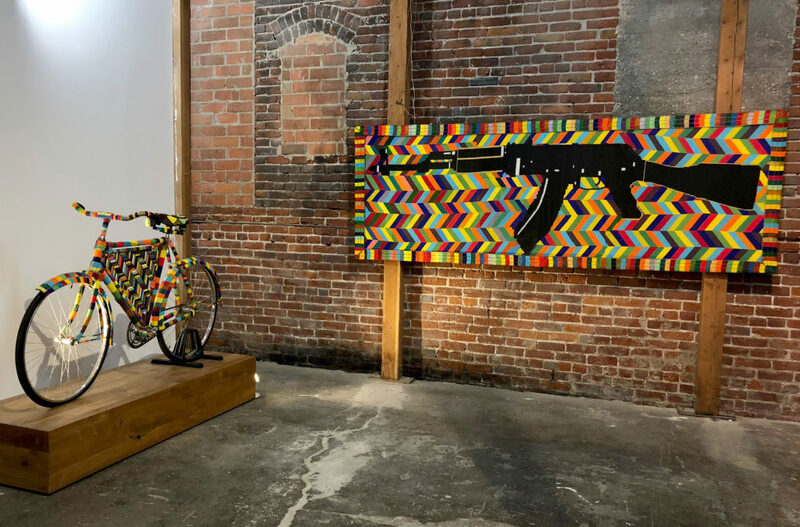 The exhibition starts with an installation of brightly colored AK-47s leading into a room with large photographs taken in Soweto. 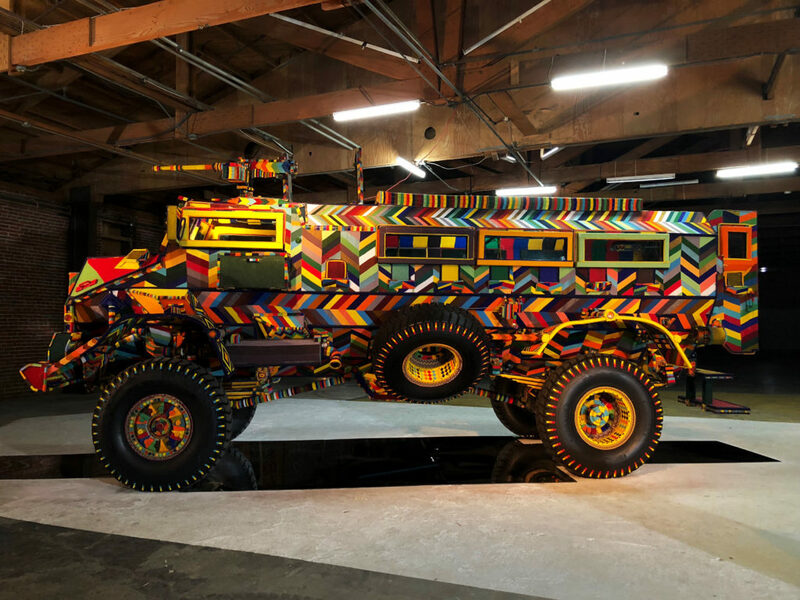 For the photos, Ziman recreated scenes from newspapers during the apartheid, incorporating many of the elements found within the exhibition such as the beaded guns and SPOEK 1. A screening room shows a 20 minute documentary by Ziman which tells the history of the Casspir, from its design and conception to people’s personal experiences with it in the ‘70s and ‘80s. It chronicles Ziman’s reclaiming of the Casspir, detailing how he transformed and Africanized it. The exhibition culminates with the dramatic presentation of SPOEK 1, lit only by a spotlight in a dark room. Opening a dialogue between those who remember and those too young to know, The Casspir Project is a profound attempt to reconcile history. Ziman has reclaimed the savagely violent brute—embellished and bedazzled, the Casspir has been made less threatening, its power and authority subverted. 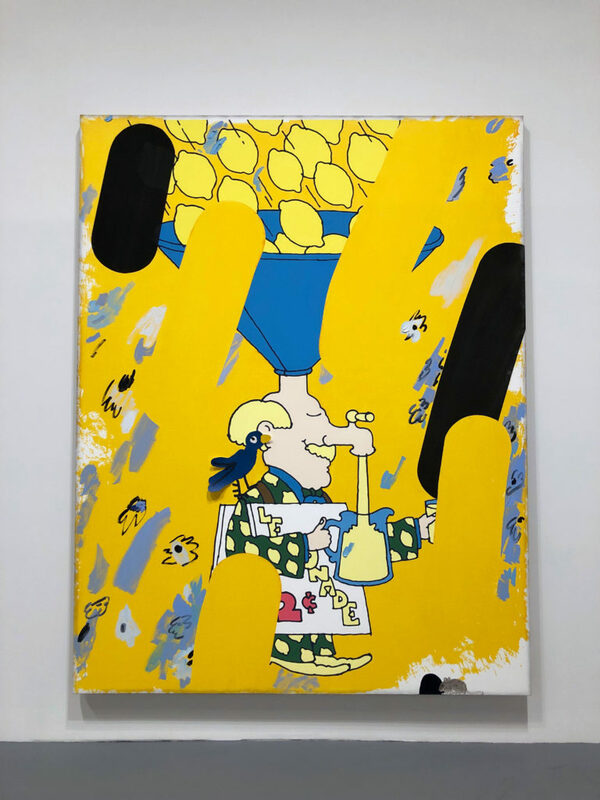 This exhibition has been extended through 3/10/19 and this weekend Ziman will be live painting at the gallery with artist Keya Tama.